Methylcobalamin (shown) is a form of vitamin B12. Physically it resembles the other forms of vitamin B12, occurring as dark red crystals that freely form cherry-colored transparent solutions in water. Vitamin B12, vitamin B12 or vitamin B-12, also called cobalamin, is a water-soluble vitamin that has a key role in the normal functioning of the brain and nervous system, and the formation of red blood cells. It is one of eight B vitamins. It is involved in the metabolism of every cell of the human body, especially affecting DNAsynthesis, fatty acid and amino acid metabolism. No fungi, plants, nor animals (including humans) are capable of producing vitamin B12. Only bacteria and archaea have the enzymes needed for its synthesis. Proved sources of B12 are animal products (meat, fish, dairy products) and supplements. Some research states that certain non-animal products possibly can be a natural source of B12 because of bacterial symbiosis. B12 is the largest and most structurally complicated vitamin and can be produced industrially only through a bacterial fermentation-synthesis. This synthetic B12 is used to fortify foods and sold as a dietary supplement. Vitamin B12 consists of a class of chemically related compounds (vitamers), all of which show pharmacological activity. It contains the biochemically rare element cobalt (chemical symbol Co) positioned in the center of a planar tetra-pyrrole ring called a corrin ring. The vitamer is produced by bacteria as hydroxocobalamin, but conversion between different forms of the vitamin occurs in the body after consumption. Vitamin B12 was discovered from[clarification needed] its relationship to the disease pernicious anemia, an autoimmune disease in which parietal cells of the stomach responsible for secreting intrinsic factor are destroyed; these cells are also responsible for secreting acid in the stomach. Because intrinsic factor is crucial for the normal absorption of B12, its lack in the presence of pernicious anemia causes a vitamin B12deficiency. Many other subtler kinds of vitamin B12 deficiency and their biochemical effects have since been elucidated. Vitamin B12 is used to treat vitamin B12 deficiency, cyanide poisoning, and hereditary deficiency of transcobalamin II. It is given as part of the Schilling test for detecting pernicious anemia. For cyanide poisoning, a large amount of hydroxocobalamin may be given intravenously and sometimes in combination with sodium thiosulfate. The mechanism of action is straightforward: the hydroxycobalamin hydroxide ligand is displaced by the toxic cyanide ion, and the resulting harmless B12complex is excreted in urine. In the United States, the Food and Drug Administration approved (in 2006) the use of hydroxocobalamin for acute treatment of cyanide poisoning. The Food and Nutrition Board of the U.S. Institute of Medicine updated Estimated Average Requirements (EARs) and Recommended Dietary Allowances (RDAs) for vitamin B12 in 1998. The current EAR for vitamin B12 for women and men ages 14 and up is 2.0 μg/day; the RDA is 2.4 μg/day. RDAs are higher than EARs so as to identify amounts that will cover people with higher than average requirements. RDA for pregnancy equals 2.6 μg/day. RDA for lactation equals 2.8 μg/day. For infants up to 12 months the Adequate Intake (AI) is 0.4-0.5 μg/day. and for children ages 1–13 years the RDA increases with age from 0.9 to 1.8 μg/day. Because 10 to 30 percent of older people may be unable to effectively absorb vitamin B12 naturally occurring in foods, it is advisable for those older than 50 years to meet their RDA mainly by consuming foods fortified with vitamin B12 or a supplement containing vitamin B12. As for safety, the Food and Nutrition Board of the U.S. Institute of Medicine sets Tolerable Upper Intake Levels (known as ULs) for vitamins and minerals when evidence is sufficient. In the case of vitamin B12there is no UL, as there is no human data for adverse effects from high doses. The European Food Safety Authority reviewed the same safety question and also reached the conclusion that there was not sufficient evidence to set a UL for vitamin B12. Collectively the EARs, RDAs and ULs are referred to as Dietary Reference Intakes. For U.S. food and dietary supplement labeling purposes the amount in a serving is expressed as a percent of Daily Value (%DV). For vitamin B12 labeling purposes 100% of the Daily Value was 6.0 μg, but as of May 2016 it has been revised downward to 2.4 μg. A table of the pre-change adult Daily Values is provided at Reference Daily Intake. Food and supplement companies have until July 2018 to comply with the change. The UK Vegan Society, the Vegetarian Resource Group, and the Physicians Committee for Responsible Medicine, among others, recommend that vegans either consistently eat B12-fortified foods or take a daily or weekly B12 supplement to meet the recommended intake. It is important for vegans, whose food provides few sources of B12, and anyone else wishing to obtain B12 from food sources other than animals, to consume foods that contain little or no pseudovitamin-B12 and are high in biologically active B12. So-called pseudovitamin-B12 refers to B12-like analogues that are biologically inactive in humans and yet found to be present alongside B12 in humans,many food sources (including animals), and possibly supplements and fortified foods. In most cyanobacteria, including Spirulina, and some algae, such as dried Asakusa-nori (Porphyra tenera), pseudovitamin-B12 is found to predominate. There have been no significant human trials of sufficient size to demonstrate enzymatic activity of B12 from nonbacterial sources, such as Chlorella and edible sea algae (seaweeds, such as lavers), although chemically some of these sources have been reported to contain B12 that seems chemically similar to the active vitamin. Vitamin B12 deficiency is most commonly caused by low intakes, but can also result from malabsorption, certain intestinal disorders, low presence of binding proteins, and use of certain medications. Vitamin B12 is rare from plant sources, so vegetarians are most likely to suffer from vitamin B12 deficiency. Infants are at a higher risk of vitamin B12 deficiency if they were born to vegetarian mothers. The elderly who have diets with limited meat or animal products are vulnerable populations as well. Vitamin B12 deficiency can manifest itself as anemia. In some cases, deficiency can cause permanent neurological damage. Recent studies show depression is associated with vitamin B12 deficiency; sufficient vitamin B12 levels are independently associated with a decreased risk of depression and better cognitive performance adjusted for confounders. Vitamin B12 is a co-substrate of various cell reactions involved in methylation synthesis of nucleic acid and neurotransmitters. Synthesis of the trimonoamine neurotransmitters can enhance the effects of a traditional antidepressant. The intracellular concentrations of vitamin B12 can be inferred through the total plasma concentration of homocysteine, which can be converted to methionine through an enzymatic reaction that uses 5-methyltetrahydrofolate as the methyl donor group. Consequently, the plasma concentration of homocysteine falls as the intracellular concentration of vitamin B12 rises. The active metabolite of vitamin B12 is required for the methylation of homocysteine in the production of methionine, which is involved in a number of biochemical processes including the monoamine neurotransmitters metabolism. Thus, a deficiency in vitamin B12 may impact the production and function of those neurotransmitters. Vitamin B12 is found in most animal-derived foods, including fish and shellfish, meat (especially liver), poultry, eggs, milk, and milk products. The bioavailability from eggs is less than 9%, compared to 40% to 60% from fish, fowl and meat. An NIH fact sheet lists a variety of animal food sources of B12. Foods fortified with B12 are also dietary sources of the vitamin. Foods for which B12-fortified versions are widely available include breakfast cereals, soyproducts, energy bars, and nutritional yeast. The UK Vegan Society, the Vegetarian Resource Group, and the Physicians Committee for Responsible Medicine, among others, recommend that every vegan who is not consuming adequate B12 from fortified foods takes supplements. Reputable manufacturers of fortified foods and dietary supplements include an overage (excess) in their formulas so that the products still contain the labeled amounts at the end of shelf life. Hydroxocobalamin injection USP (1000 µg/mL) is a clear red liquid solution of hydroxocobalamin which is available in a 30 mL brown glass multidose vial packaged in a paper box. Shown is 500 µg B12 (as 1/2 cc) drawn up in a 1/2 cc U-100 27 gauge x 1/2" insulin syringe, as prepared for subcutaneous injection. Vitamin B12 is an ingredient in multi-vitamin pills and in some countries used to enrich grain-based foods such as bread and pasta. In the U.S. non-prescription products can be purchased providing up to 5000 µg/serving, and it is a common ingredient in energy drinks and energy shots, usually at many times the recommended dietary allowance of B12. The vitamin can also be a prescription product via injection or other means. The sublingual route, in which B12 is presumably or supposedly taken in more directly under the tongue, has not proven to be necessary or helpful, even though a number of lozenges, pills, and even a lollipop designed for sublingual absorption are being marketed. A 2003 study found no significant difference in absorption for serum levels from oral versus sublingual delivery of 0.5 mg of cobalamin. Sublingual methods of replacement are effective only because of the typically high doses (0.5 mg), which are swallowed, not because of placement of the tablet. As noted below, such very high doses of oral B12 may be effective as treatments, even if gastro-intestinal tract absorption is impaired by gastric atrophy (pernicious anemia). Injection and patches are sometimes used if digestive absorption is impaired, but there is evidence that this course of action may not be necessary with modern high-potency oral supplements (such as 0.5–1 mg or more). Even pernicious anemia can be treated entirely by the oral route. These supplements carry such large doses of the vitamin that 1% to 5% of high oral doses of free crystalline B12 is absorbed along the entire intestine by passive diffusion. If the patient has inborn errors in the methyltransfer pathway (cobalamin C disease, combined methylmalonic aciduria and homocystinuria), treatment with intravenous, intramuscular hydroxocobalamin or transdermal B12 is needed. Recently sublingual methylcobalamin has become available in 5 mg tablets. The metabolic fate and biological distribution of methylcobalamin are expected to be similar to that of other sources of vitamin B12 in the diet. No cyanide is released with methylcobalamin. The amount of cyanide (20 µg cyanide in a 1,000 µg cyanocobalamin tablet) is less than daily consumption from food. Safety of all forms of the vitamin is well established. Besides certain fermented foods, there are few known plant, fungus or algae sources of biologically active B12 and none of these have been subjected to human trials. Spirulina and dried Asakusa-nori (Porphyra tenera) have been found to contain mostly pseudovitamin-B12 (see Controversial sources in algae section) instead of biologically active B12. Elevated levels of serum B12 or cobalamin (above about 600 pmol/L) in the absence of supplementation may be a diagnostic sign of serious disease. In such cases B12 is thought to be only a marker for disease, and not a causal agent. A second group of non-supplemented patients with high cobalamin levels have them due to enhanced production of the plasma B12 transporters haptocorrin and transcobalamin II  This happens in hematologic disorders like chronic myelogeneous leukemia, promyelocytic leukemia, polycythemia vera and also the hypereosinophilic syndrome. Increased cobalamin levels are one of the diagnostic criteria for the latter two diseases. A third group of non-supplemented patients with high cobalamin levels (> 600 pmol/L) may be at immediate (mostly within one year of testing) higher risk for new diagnosis of certain smoking and alcohol-related cancers which are non-hematologic. In a study of 333,000 persons in Denmark, those with elevated B12 had a three to six times higher standard incidence ratio, with respect to those with normal B12 levels, for later development of certain types of cancer. Vitamin B12 may interact with prescription drugs. H2-receptor antagonists: include cimetidine (Tagamet), famotidine (Pepcid), nizatidine (Axid), and ranitidine (Zantac). Reduced secretion of gastric acidand pepsin produced by H2 blockers can reduce absorption of protein-bound (dietary) vitamin B12, but not of supplemental vitamin B12. Gastric acid is needed to release vitamin B12 from protein for absorption. Clinically significant vitamin B12 deficiency and megaloblastic anemia are unlikely, unless H2blocker therapy is prolonged (2 years or more), or the person's diet is poor. It is also more likely if the person is rendered achlorhydric(with complete absence of gastric acid secretion), which occurs more frequently with proton pump inhibitors than H2 blockers. Vitamin B12 levels should be monitored in people taking high doses of H2 blockers for prolonged periods. Metformin (Glucophage): Metformin may reduce serum folic acid and vitamin B12 levels. Long-term use of metformin substantially increases the risk of B12 deficiency and (in those patients who become deficient) hyperhomocysteinemia, which is "an independent risk factor for cardiovascular disease, especially among individuals with type 2 diabetes". There are also rare reports of megaloblastic anemia in people who have taken metformin for five years or more. Reduced serum levels of vitamin B12 occur in up to 30% of people taking metformin chronically. Clinically significant deficiency is not likely to develop if dietary intake of vitamin B12 is adequate. Deficiency can be corrected with vitamin B12 supplements even if metformin is continued. The metformin-induced malabsorption of vitamin B12 is reversible by oral calcium supplementation. The general clinical significance of metformin upon B12 levels is as yet unknown. Proton pump inhibitors (PPIs): The PPIs include omeprazole (Prilosec, Losec), lansoprazole (Prevacid), rabeprazole (Aciphex), pantoprazole (Protonix, Pantoloc), and esomeprazole (Nexium). The reduced secretion of gastric acid and pepsin produced by PPIs can reduce absorption of protein-bound (dietary) vitamin B12, but not supplemental vitamin B12. Gastric acid is needed to release vitamin B12 from protein for absorption. Reduced vitamin B12levels may be more common with PPIs than with H2-blockers, because they are more likely to produce achlorhydria (complete absence of gastric acid secretion). Clinically significant vitamin B12 deficiency is unlikely, unless PPI therapy is prolonged (2 years or more) or dietary vitamin intake is low. Vitamin B12 levels should be monitored in people taking high doses of PPIs for prolonged periods. B12 is the most chemically complex of all the vitamins. The structure of B12 is based on a corrin ring, which is similar to the porphyrin ring found in heme, chlorophyll, and cytochrome. The central metal ion is cobalt. Four of the six coordination sites are provided by the corrin ring, and a fifth by a dimethylbenzimidazole group. The sixth coordination site, the center of reactivity, is variable, being a cyano group (-CN), a hydroxyl group (-OH), a methylgroup (-CH3) or a 5'-deoxyadenosyl group (here the C5' atom of the deoxyribose forms the covalent bond with Co), respectively, to yield the four B12 forms mentioned below. Historically, the covalent C-Co bond is one of the first examples of carbon-metal bonds to be discovered in biology. The hydrogenasesand, by necessity, enzymes associated with cobalt utilization, involve metal-carbon bonds. Vitamin B12 is a generic descriptor name referring to a collection of cobalt and corrin ring molecules which are defined by their particular vitamin function in the body. All of the substrate cobalt-corrin molecules from which B12 is made, must be synthesized by bacteria. After this synthesis is complete, except in rare cases, the human body has the ability to convert any form of B12 to an active form, by means of enzymatically removing certain prosthetic chemical groups from the cobalt atom, and replacing them with others. The four forms (vitamers) of B12 are all deeply red colored crystals and water solutions, due to the color of the cobalt-corrin complex. Cyanocobalamin is one such form, i.e. "vitamer", of B12 because it can be metabolized in the body to an active coenzyme form. The cyanocobalamin form of B12 does not occur in nature normally, but is a byproduct of the fact that other forms of B12 are avid binders of cyanide (-CN) which they pick up in the process of activated charcoal purification of the vitamin after it is made by bacteria in the commercial process. Since the cyanocobalamin form of B12 is easy to crystallize and is not sensitive to air-oxidation, it is typically used as a form of B12 for food additives and in many common multivitamins. Pure cyanocobalamin possesses the deep pink color associated with most octahedral cobalt(II) complexes and the crystals are well formed and easily grown up to millimeter size. Hydroxocobalamin is another form of B12 commonly encountered in pharmacology, but which is not normally present in the human body. Hydroxocobalamin is sometimes denoted B12a. This form of B12 is the form produced by bacteria, and is what is converted to cyanocobalmin in the commercial charcoal filtration step of production. Hydroxocobalamin has an avid affinity for cyanide ions and has been used as an antidote to cyanide poisoning. It is supplied typically in water solution for injection. Hydroxocobalamin is thought to be converted to the active enzymic forms of B12 more easily than cyanocobalamin, and since it is little more expensive than cyanocobalamin, and has longer retention times in the body, has been used for vitamin replacement in situations where added reassurance of activity is desired. 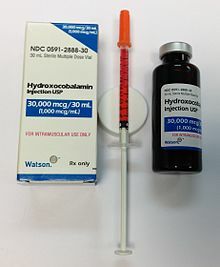 Intramuscular administration of hydroxocobalamin is also the preferred treatment for pediatric patients with intrinsic cobalamin metabolic diseases, for vitamin B12 deficient patients with tobacco amblyopia (which is thought to perhaps have a component of cyanide poisoning from cyanide in cigarette smoke); and for treatment of patients with pernicious anemia who have optic neuropathy. Adenosylcobalamin (adoB12) and methylcobalamin (MeB12) are the two enzymatically active cofactor forms of B12 that naturally occur in the body. Most of the body's reserves are stored as adoB12 in the liver. These are converted to the other methylcobalamin form as needed. Neither plants nor animals are independently capable of constructing vitamin B12. Only bacteria and archaea have the enzymes required for its biosynthesis. The total synthesis of B12 was reported by Robert Burns Woodward and Albert Eschenmoser in 1972, and remains one of the classic feats of organic synthesis. Species from the following genera are known to synthesize B12: Acetobacterium, Aerobacter, Agrobacterium, Alcaligenes, Azotobacter, Bacillus, Clostridium, Corynebacterium, Flavobacterium, Lactobacillus, Micromonospora, Mycobacterium, Nocardia, Propionibacterium, Protaminobacter, Proteus, Pseudomonas, Rhizobium, Salmonella, Serratia, Streptomyces, Streptococcus and Xanthomonas. Industrial production of B12 is achieved through fermentation of selected microorganisms. Streptomyces griseus, a bacterium once thought to be a yeast, was the commercial source of vitamin B12 for many years. The species Pseudomonas denitrificans and Propionibacterium freudenreichii subsp. shermanii are more commonly used today. These are frequently grown under special conditions to enhance yield, and at least one company, Rhône-Poulenc of France, which has merged into Sanofi-Aventis, used genetically engineered versions of one or both of these species. Since a number of species of Propionibacterium produce no exotoxins or endotoxins and are generally regarded as safe (have been granted GRAS status) by the Food and Drug Administration of the United States, they are presently the FDA-preferred bacterial fermentation organisms for vitamin B12production. The total world production of vitamin B12, by four companies (the French Sanofi-Aventis and three Chinese companies) is said to have been 35 tonnes in 2008. See cyanocobalamin for discussion of the chemical preparation of reduced-cobalt vitamin analogs and preparation of physiological forms of the vitamin such as adenosylcobalamin and methylcobalamin. Metabolism of folic acid. The role of Vitamin B12 is seen at bottom-left. Rearrangements in which a hydrogen atom is directly transferred between two adjacent atoms with concomitant exchange of the second substituent, X, which may be a carbon atom with substituents, an oxygen atom of an alcohol, or an amine. These use the adoB12(adenosylcobalamin) form of the vitamin. Methyl (-CH3) group transfers between two molecules. These use MeB12(methylcobalamin) form of the vitamin. Reactions in which a halogen atom is removed from an organic molecule. Enzymes in this class have not been identified in humans. MUT is an isomerase which uses the AdoB12 form and reaction type 1 to catalyze a carbon skeleton rearrangement (the X group is -COSCoA). MUT's reaction converts MMl-CoA to Su-CoA, an important step in the extraction of energy from proteins and fats (for more see MUT's reaction mechanism). This functionality is lost in vitamin B12 deficiency, and can be measured clinically as an increased methylmalonic acid (MMA) level. Unfortunately, an elevated MMA, though sensitive to B12 deficiency, is probably overly sensitive, and not all who have it actually have B12deficiency. For example, MMA is elevated in 90–98% of patients with B12 deficiency; 20–25% of patients over the age of 70 have elevated levels of MMA, yet 25–33% of them do not have B12 deficiency. For this reason, assessment of MMA levels is not routinely recommended in the elderly. There is no "gold standard" test for B12 deficiency because as a B12 deficiency occurs, serum values may be maintained while tissue B12 stores become depleted. Therefore, serum B12 values above the cut-off point of deficiency do not necessarily indicate adequate B12 status. The MUT function is necessary for proper myelin synthesis (see mechanism below) and is not affected by folate supplementation. MTR, also known as methionine synthase, is a methyltransferase enzyme, which uses the MeB12 and reaction type 2 to transfer a methyl group from 5-methyltetrahydrofolate to homocysteine, thereby generating tetrahydrofolate (THF) and methionine (for more see MTR's reaction mechanism). This functionality is lost in vitamin B12 deficiency, resulting in an increased homocysteine level and the trapping of folate as 5-methyl-tetrahydrofolate, from which THF (the active form of folate) cannot be recovered. THF plays an important role in DNA synthesis so reduced availability of THF results in ineffective production of cells with rapid turnover, in particular red blood cells, and also intestinal wall cells which are responsible for absorption. THF may be regenerated via MTR or may be obtained from fresh folate in the diet. Thus all of the DNA synthetic effects of B12 deficiency, including the megaloblastic anemia of pernicious anemia, resolve if sufficient dietary folate is present. Thus the best-known "function" of B12 (that which is involved with DNA synthesis, cell-division, and anemia) is actually a facultative function which is mediated by B12-conservation of an active form of folate which is needed for efficient DNA production. Other cobalamin-requiring methyltransferase enzymes are also known in bacteria, such as Me-H4-MPT, coenzyme M methyl transferase. The specific myelin damage resulting from B12 deficiency, even in the presence of adequate folate and methionine, is more specifically and clearly a vitamin deficiency problem. It has been connected to B12 most directly by reactions related to MUT, which is absolutely required to convert methylmalonyl coenzyme A into succinyl coenzyme A. Failure of this second reaction to occur results in elevated levels of MMA, a myelin destabilizer. Excessive MMA will prevent normal fatty acid synthesis, or it will be incorporated into fatty acid itself rather than normal malonic acid. If this abnormal fatty acid subsequently is incorporated into myelin, the resulting myelin will be too fragile, and demyelination will occur. Although the precise mechanism(s) are not known with certainty, the result is subacute combined degeneration of central nervous system and spinal cord. Whatever the cause, it is known that B12 deficiency causes neuropathies, even if folic acid is present in good supply, and therefore anemia is not present. Methyl-B12 is absorbed by two processes. The first is an intestinal mechanism using intrinsic factor through which 1-2 micrograms can be absorbed every few hours. The second is a diffusion process by which approximately 1% of the remainder is absorbed. The human physiology of vitamin B12 is complex, and therefore is prone to mishaps leading to vitamin B12 deficiency. Protein-bound vitamin B12 must be released from the proteins by the action of digestive proteases in both the stomach and small intestine. Gastric acid releases the vitamin from food particles; therefore antacid and acid-blocking medications (especially proton-pump inhibitors) may inhibit absorption of B12. In addition some elderly people produce less stomach acid as they age thereby increasing their probability of B12 deficiencies. B12 taken in a low-solubility, non-chewable supplement pill form may bypass the mouth and stomach and not mix with gastric acids, but acids are not necessary for the absorption of free B12 not bound to protein; acid is necessary only to recover naturally-occurring vitamin B12 from foods. R-protein (also known as haptocorrin and cobalophilin) is a B12 binding protein that is produced in the salivary glands. It must wait to bind food-B12 until B12 has been freed from proteins in food by pepsin in the stomach. B12 then binds to the R-protein to avoid degradation of it in the acidic environment of the stomach. This pattern of B12 transfer to a special binding protein secreted in a previous digestive step, is repeated once more before absorption. The next binding protein for B12 is intrinsic factor (IF), a protein synthesized by gastric parietal cells that is secreted in response to histamine, gastrin and pentagastrin, as well as the presence of food. In the duodenum, proteases digest R-proteins and release their bound B12, which then binds to IF, to form a complex (IF/B12). B12 must be attached to IF for it to be efficiently absorbed, as receptors on the enterocytes in the terminal ileum of the small bowel only recognize the B12-IF complex; in addition, intrinsic factor protects the vitamin from catabolism by intestinal bacteria. Absorption of food vitamin B12 thus requires an intact and functioning stomach, exocrine pancreas, intrinsic factor, and small bowel. Problems with any one of these organs makes a vitamin B12 deficiency possible. Individuals who lack intrinsic factor have a decreased ability to absorb B12. In pernicious anemia, there is a lack of IF due to autoimmune atrophic gastritis, in which antibodies form against parietal cells. Antibodies may alternately form against and bind to IF, inhibiting it from carrying out its B12 protective function. Due to the complexity of B12 absorption, geriatric patients, many of whom are hypoacidic due to reduced parietal cell function, have an increased risk of B12 deficiency. This results in 80–100% excretion of oral doses in the feces versus 30–60% excretion in feces as seen in individuals with adequate IF. Once the IF/B12 complex is recognized by specialized ileal receptors, it is transported into the portal circulation. The vitamin is then transferred to transcobalamin II (TC-II/B12), which serves as the plasma transporter. Hereditary defects in production of the transcobalamins and their receptors may produce functional deficiencies in B12 and infantile megaloblastic anemia, and abnormal B12 related biochemistry, even in some cases with normal blood B12 levels. For the vitamin to serve inside cells, the TC-II/B12 complex must bind to a cell receptor, and be endocytosed. The transcobalamin-II is degraded within a lysosome, and free B12 is finally released into the cytoplasm, where it may be transformed into the proper coenzyme, by certain cellular enzymes (see above). Investigations into the intestinal absorption of B12 point out that the upper limit of absorption per single oral dose, under normal conditions, is about 1.5 µg: "Studies in normal persons indicated that about 1.5 µg is assimilated when a single dose varying from 5 to 50 µg is administered by mouth. In a similar study Swendseid et al. stated that the average maximum absorption was 1.6 µg [...]"  The bulk diffusion process of B12 absorption noted in the first paragraph above, may overwhelm the complex R-factor and IGF-factor dependent absorption, when oral doses of B12 are very large (a thousand or more µg per dose) as commonly happens in dedicated-pill oral B12 supplementation. It is this last fact which allows pernicious anemia and certain other defects in B12 absorption to be treated with oral megadoses of B12, even without any correction of the underlying absorption defects. See the section on supplements above. The total amount of vitamin B12 stored in body is about 2–5 mg in adults. Around 50% of this is stored in the liver. Approximately 0.1% of this is lost per day by secretions into the gut, as not all these secretions are reabsorbed. Bile is the main form of B12 excretion; most of the B12 secreted in the bile is recycled via enterohepatic circulation. Excess B12 beyond the blood's binding capacity is typically excreted in urine. Owing to the extremely efficient enterohepatic circulation of B12, the liver can store 3 to 5 years’ worth of vitamin B12; therefore, nutritional deficiency of this vitamin is rare. How fast B12 levels change depends on the balance between how much B12 is obtained from the diet, how much is secreted and how much is absorbed. B12 deficiency may arise in a year if initial stores are low and genetic factors unfavourable, or may not appear for decades. In infants, B12 deficiency can appear much more quickly. B12 deficiency is the cause of pernicious anemia, an anemic disease that was usually fatal and had unknown etiology when it was first described in medicine. The cure, and B12, were discovered by accident. George Whipple had been doing experiments in which he induced anemia in dogs by bleeding them, and then fed them various foods to observe which diets allowed them fastest recovery from the anemia produced. In the process, he discovered that ingesting large amounts of liver seemed to most rapidly cure the anemia of blood loss. Thus, he hypothesized that liver ingestion might treat pernicious anemia. He tried this and reported some signs of success in 1920. After a series of clinical studies, George Richards Minot and William Murphy set out to partly isolate the substance in liver which cured anemia in dogs, and found that it was iron. They also found that an entirely different liver substance cured pernicious anemia in humans, that had no effect on dogs under the conditions used. The specific factor treatment for pernicious anemia, found in liver juice, had been found by this coincidence. Minot and Murphy reported these experiments in 1926. This was the first real progress with this disease. Despite this discovery, for several years patients were still required to eat large amounts of raw liver or to drink considerable amounts of liver juice. In 1928, the chemist Edwin Cohn prepared a liver extract that was 50 to 100 times more potent than the natural liver products. The extract was the first workable treatment for the disease. For their initial work in pointing the way to a working treatment, Whipple, Minot, and Murphy shared the 1934 Nobel Prize in Physiology or Medicine. These events led to discovery of the soluble vitamin, called vitamin B12, from bacterial broths. In 1947, while working for the Poultry Science Department at the University of Maryland, Mary Shaw Shorb (in a collaborative project with Karl Folkers from Merck.) was provided with a $400 grant to develop the so-called "LLD assay" for B12. LLD stood for Lactobacillus lactis Dorner, a strain of bacterium which required "LLD factor" for growth, which was eventually identified as B12. Shorb and colleagues used the LLD assay to rapidly extract the anti-pernicious anemia factor from liver extracts, and pure B12 was isolated in this way by 1948, with the contributions of chemists Shorb, Karl A. Folkers of the United States and Alexander R. Todd of Great Britain. For this discovery, in 1949 Mary Shorb and Karl Folkers received the Mead Johnson Award from the American Society of Nutritional Sciences. The chemical structure of the molecule was determined by Dorothy Crowfoot Hodgkin and her team in 1956, based on crystallographic data. Eventually, methods of producing the vitamin in large quantities from bacteria cultures were developed in the 1950s, and these led to the modern form of treatment for the disease. Jump up^ Yamada, Kazuhiro (2013). "Chapter 9. Cobalt: Its Role in Health and Disease". In Astrid Sigel, Helmut Sigel and Roland K. O. Sigel. Interrelations between Essential Metal Ions and Human Diseases. Metal Ions in Life Sciences. 13. Springer. pp. 295–320. doi:10.1007/978-94-007-7500-8_9. ^ Jump up to:a b c d e "Dietary Supplement Fact Sheet: Vitamin B12". Office of Dietary Supplements, National Institutes of Health. Retrieved September 28, 2011. ^ Jump up to:a b "Vitamin B12". The American Society of Health-System Pharmacists. Retrieved 3 April 2011. Jump up^ Hall AH, Rumack BH (1987). "Hydroxycobalamin/sodium thiosulfate as a cyanide antidote". The Journal of Emergency Medicine. 5 (2): 115–21. doi:10.1016/0736-4679(87)90074-6. PMID 3295013. Jump up^ Dart RC (2006). "Hydroxocobalamin for acute cyanide poisoning: new data from preclinical and clinical studies; new results from the prehospital emergency setting". Clinical Toxicology. 44 (Suppl 1): 1–3. doi:10.1080/15563650600811607. PMID 16990188. Jump up^ "Tolerable Upper Intake Levels For Vitamins And Minerals" (PDF). European Food Safety Authority. 2006. Jump up^ Institute of Medicine (1998). "Vitamin B12". Dietary Reference Intakes for Thiamin, Riboflavin, Niacin, Vitamin B6, Folate, Vitamin B12, Pantothenic Acid, Biotin, and Choline. Washington, DC: The National Academies Press. pp. 340–342. ISBN 0-309-06554-2. Retrieved 2012-02-07. Jump up^ Walsh, Stephen. "What every vegan should know about vitamin B12". Vegan Society. Archived from the original on 2007-07-17. Retrieved 2007-12-03. ^ Jump up to:a b Mangels, Reed. "Vitamin B12 in the Vegan Diet". Vegetarian Resource Group. Retrieved 2008-01-17. ^ Jump up to:a b "Don't Vegetarians Have Trouble Getting Enough Vitamin B12?". Physicians Committee for Responsible Medicine. Retrieved 2008-01-17. Jump up^ Albert, M. J.; Mathan, V. I.; Baker, S. J. (1980). "Vitamin B12 synthesis by human small intestinal bacteria". Nature. 283 (5749): 781–782. doi:10.1038/283781a0. PMID 7354869. Jump up^ Kelly, R. J.; Gruner, T. M.; Furlong, J. M.; Sykes, A. R. (2006). "Analysis of corrinoids in ovine tissues". Biomedical Chromatography. 20 (8): 806–814. doi:10.1002/bmc.604. PMID 16345011. Jump up^ Yamada, K.; Shimodaira, M.; Chida, S.; Yamada, N.; Matsushima, N.; Fukuda, M.; Yamada, S. (2008). "Degradation of Vitamin B12 in Dietary Supplements". International Journal for Vitamin and Nutrition Research. 78(45): 195–203. doi:10.1024/0300-9831.78.45.195. PMID 19326342. ^ Jump up to:a b Watanabe, F.; Katsura, H.; Takenaka, S.; Fujita, T.; Abe, K.; Tamura, Y.; Nakatsuka, T.; Nakano, Y. (1999). "Pseudovitamin B(12) is the predominant cobamide of an algal health food, spirulina tablets". Journal of Agricultural and Food Chemistry. 47 (11): 4736–4741. doi:10.1021/jf990541b. PMID 10552882. Jump up^ Kittaka-Katsura, H.; Fujita, T.; Watanabe, F.; Nakano, Y. (2002). "Purification and characterization of a corrinoid compound from Chlorella tablets as an algal health food". Journal of Agricultural and Food Chemistry. 50 (17): 4994–4997. doi:10.1021/jf020345w. PMID 12166996. Jump up^ Put, Nathalie M. J. van der; Straaten, Henny W. M. van; Trijbels, Frans J. M.; Blom, Henk J. (2001-04-01). "Folate, Homocysteine and Neural Tube Defects: An Overview". Experimental Biology and Medicine. 226 (4): 243–270. ISSN 1535-3702. PMID 11368417. Jump up^ Sethi NK, Robilotti E, Sadan Y (2005). "Neurological Manifestations Of Vitamin B-12 Deficiency". The Internet Journal of Nutrition and Wellness. 2(1). doi:10.5580/5a9. Jump up^ Masalha R, Chudakov B, Muhamad M, Rudoy I, Volkov I, Wirguin I (2001). "Cobalamin-responsive psychosis as the sole manifestation of vitamin B12deficiency". Israeli Medical Association Journal. 3: 701–703. PMID 11574992. Jump up^ Killen, J. P.; Brenninger, V. L. (2013). "Vitamin B12 deficiency". N. Engl. J. Med. 368: 2040–1. doi:10.1056/nejmc1304350. Jump up^ Biemans, E.; Hart, H.E. ; Rutten, G.E. ; Renteria, V.G.C. ; Kooijman-Buiting, A.M.; Beulens, J.W. (2014). "Cobalamin status has a relationship with depression, cognition and neuropathy in patients with Type 2 diabetes mellitus using metformin". Acta Diabetologica: 1–11. Jump up^ Bottiglieri, T.; Laundy, M.; Crellin, R.; Toone, B.K. ; Carney, M.W. ; Reynolds, E.H. (2000). "Homocysteine, folate, methylation, and monoamine metabolism in depression". Journal of Neurology, Neurosurgery & Psychiatry. 69 (2): 228–232. doi:10.1136/jnnp.69.2.228. Jump up^ Watanabe F (2007). "Vitamin B12 sources and bioavailability". Exp. Biol. Med. (Maywood). 232 (10): 1266–74. doi:10.3181/0703-MR-67. PMID 17959839. Jump up^ Walsh, Stephen, RD. "Vegan Society B12factsheet". Vegan Society. Retrieved 2008-01-17. Jump up^ Sharabi, A; Cohen, E; Sulkes, J; Garty, M (2003). "Replacement therapy for vitamin B12 deficiency: comparison between the sublingual and oral route". British Journal of Clinical Pharmacology. 56 (6): 635–8. doi:10.1046/j.1365-2125.2003.01907.x. PMC 1884303 . PMID 14616423. Jump up^ Bolaman Z, Kadikoylu G, Yukselen V, Yavasoglu I, Barutca S, Senturk T; Kadikoylu; Yukselen; Yavasoglu; Barutca; Senturk (2003). "Oral versus intramuscular cobalamin treatment in megaloblastic anemia: a single-center, prospective, randomized, open-label study". Clin Ther. 25 (12): 3124–34. doi:10.1016/S0149-2918(03)90096-8. PMID 14749150. Jump up^ Lane LA, Rojas-Fernandez C; Rojas-Fernandez (2002). "Treatment of vitamin b(12)-deficiency anemia: oral versus parenteral therapy". Ann Pharmacother. 36 (7–8): 1268–72. doi:10.1345/aph.1A122. PMID 12086562. Jump up^ Butler, C. C. (2006). "Oral vitamin B12 versus intramuscular vitamin B12 for vitamin B12 deficiency: A systematic review of randomized controlled trials". Family Practice. 23 (3): 279–285. doi:10.1093/fampra/cml008. PMID 16585128. Jump up^ Andersson HC, Shapira E; Shapira (1998). "Biochemical and clinical response to hydroxocobalamin versus cyanocobalamin treatment in patients with methylmalonic acidemia and homocystinuria (cblC)". J. Pediatr. 132 (1): 121–4. doi:10.1016/S0022-3476(98)70496-2. PMID 9470012. Jump up^ Roze E, Gervais D, Demeret S, et al. (2003). "Neuropsychiatric disturbances in presumed late-onset cobalamin C disease". Arch. Neurol. 60(10): 1457–62. doi:10.1001/archneur.60.10.1457. PMID 14568819. Jump up^ Thauvin-Robinet C, Roze E, Couvreur G, et al. (2008). "The adolescent and adult form of cobalamin C disease: clinical and molecular spectrum". J. Neurol. Neurosurg. Psychiatr. 79 (6): 725–8. doi:10.1136/jnnp.2007.133025. PMID 18245139. Jump up^ Heil SG, Hogeveen M, Kluijtmans LA; et al. (2007). "Marfanoid features in a child with combined methylmalonic aciduria and homocystinuria (CblC type)". J. Inherit. Metab. Dis. 30 (5): 811. doi:10.1007/s10545-007-0546-6. PMID 17768669. Jump up^ Tsai, A. C. H.; Morel, C. F.; Scharer, G.; Yang, M.; Lerner-Ellis, J. P.; Rosenblatt, D. S.; Thomas, J. A. (2007). "Late-onset combined homocystinuria and methylmalonic aciduria (cblC) and neuropsychiatric disturbance". American Journal of Medical Genetics Part A. 143A (20): 2430–2434. doi:10.1002/ajmg.a.31932. PMID 17853453. ^ Jump up to:a b Aguilar, F.; et al. (September 25, 2008). "5'-deoxyadenosylcobalamin and methylcobalamin as sources for Vitamin B12 added as a nutritional substance in food supplements: Scientific opinion of the Scientific Panel on Food Additives and Nutrient Sources added to food". EFSA Journal. 815: 1–21. doi:10.2903/j.efsa.2008.815. "the metabolic fate and biological distribution of methylcobalamin and 5’-deoxyadenosylcobalamin are expected to be similar to that of other sources of vitamin B12 in the diet." Jump up^ Kwak, C. S.; Lee, M. S.; Lee, H. J.; Whang, J. Y.; Park, S. C. (2010). "Dietary source of vitamin B12intake and vitamin B12status in female elderly Koreans aged 85 and older living in rural area". Nutrition Research and Practice. 4 (3): 229–234. doi:10.4162/nrp.2010.4.3.229. PMC 2895704 . PMID 20607069. Jump up^ Kwak, C. S.; Lee, M. S.; Oh, S. I.; Park, S. C. (2010). "Discovery of Novel Sources of Vitamin B12 in Traditional Korean Foods from Nutritional Surveys of Centenarians". Current Gerontology and Geriatrics Research. 2010: 1–11. doi:10.1155/2010/374897. PMC 3062981 . PMID 21436999. Jump up^ Yamada, K.; Yamada, Y.; Fukuda, M.; Yamada, S. (1999). "Bioavailability of dried asakusanori (porphyra tenera) as a source of Cobalamin (Vitamin B12)". International journal for vitamin and nutrition research. Internationale Zeitschrift fur Vitamin- und Ernahrungsforschung. Journal international de vitaminologie et de nutrition. 69 (6): 412–418. doi:10.1024/0300-9831.69.6.412. PMID 10642899. Jump up^ De Jager, J.; Kooy, A.; Lehert, P.; Wulffelé, M. G.; Van Der Kolk, J.; Bets, D.; Verburg, J.; Donker, A. J. M.; Stehouwer, C. D. A. (2010). "Long term treatment with metformin in patients with type 2 diabetes and risk of vitamin B-12 deficiency: Randomised placebo controlled trial". BMJ. 340: c2181. doi:10.1136/bmj.c2181. PMC 2874129 . PMID 20488910. Jump up^ Andrès E, Noel E, Goichot B (2002). "Metformin-associated vitamin B12 deficiency". Arch Intern Med. 162 (19): 2251–2. doi:10.1001/archinte.162.19.2251-a. PMID 12390080. Jump up^ Gilligan M (2002). "Metformin and vitamin B12 deficiency". Arch Intern Med. 162 (4): 484–5. doi:10.1001/archinte.162.4.484. PMID 11863489. Jump up^ Bauman, WA; Shaw, S; Jayatilleke, E; Spungen, AM; Herbert, V (2000). "Increased intake of calcium reverses vitamin B12 malabsorption induced by metformin". Diabetes Care. 23 (9): 1227–31. doi:10.2337/diacare.23.9.1227. PMID 10977010. Jump up^ Copp, Samantha (2007-12-01). "What effect does metformin have on vitamin B12 levels?". UK Medicines Information, NHS. Archived from the original on September 27, 2007. Jump up^ Loeffler, G. (2005). Basiswissen Biochemie. Heidelberg: Springer. p. 606. ISBN 3-540-23885-9. Jump up^ Bertrand EM, Saito MA, Young JJ, Neilan BA (2011). "Vitamin B12biosynthesis gene diversity in the Ross Sea: the identification of a new group of putative polar B12 biosynthes". Environmental Microbiology. 13 (5): 1285–98. doi:10.1111/j.1462-2920.2011.02428.x. PMID 21410623. Jump up^ Khan, Adil Ghani; Eswaran, S. V. (2003). "Woodward's synthesis of vitamin B12". Resonance. 8 (6): 8–16. doi:10.1007/BF02837864. Jump up^ Eschenmoser A, Wintner CE (June 1977). "Natural product synthesis and vitamin B12". Science. 196 (4297): 1410–20. doi:10.1126/science.867037. PMID 867037. Jump up^ Riether, Doris; Mulzer, Johann (2003). "Total Synthesis of Cobyric Acid: Historical Development and Recent Synthetic Innovations". European Journal of Organic Chemistry. 2003: 30–45. doi:10.1002/1099-0690(200301)2003:1<30::AID-EJOC30>3.0.CO;2-I. Jump up^ Martens JH, Barg H, Warren MJ, Jahn D (2002). "Microbial production of vitamin B12". Applied Microbiology and Biotechnology. 58 (3): 275–85. doi:10.1007/s00253-001-0902-7. PMID 11935176. Jump up^ Linnell JC, Matthews DM (1984). "Cobalamin metabolism and its clinical aspects". Clinical Science. 66 (2): 113–21. PMID 6420106. Jump up^ De Baets S, Vandedrinck S, Vandamme EJ (2000). "Vitamins and Related Biofactors, Microbial Production". In Lederberg J. Encyclopedia of Microbiology. 4 (2nd ed.). New York: Academic Press. pp. 837–853. ISBN 0-12-226800-8. Jump up^ Riaz, Muhammad; Iqbal, Fouzia; Akram, Muhammad (2007). "Microbial production of vitamin B12 by methanol utilizing strain of Pseudomonasspecie". Pak J. Biochem. Mol. Biol. 1. 40: 5–10. Jump up^ Yemei, Zhang (January 26, 2009) New round of price slashing in vitamin B12 sector. (Fine and Specialty). China Chemical Reporter. Jump up^ Voet, Judith G.; Voet, Donald (1995). Biochemistry. New York: J. Wiley & Sons. p. 675. ISBN 0-471-58651-X. OCLC 31819701. Jump up^ Banerjee, R; Ragsdale, SW (2003). "The many faces of vitamin B12: catalysis by cobalamin-dependent enzymes". Annual Review of Biochemistry. 72: 209–47. doi:10.1146/annurev.biochem.72.121801.161828. PMID 14527323. Jump up^ Banerjee RV, Matthews RG (1990). "Cobalamin-dependent methionine synthase". The FASEB Journal. 4 (5): 1450–9. PMID 2407589. Jump up^ Wickramasinghe SN (1995). "Morphology, biology and biochemistry of cobalamin- and folate-deficient bone marrow cells". Baillière's Clinical Haematology. 8 (3): 441–59. doi:10.1016/S0950-3536(05)80215-X. PMID 8534956. Jump up^ Naidich MJ, Ho SU (2005). "Case 87: Subacute combined degeneration". Radiology. 237 (1): 101–5. doi:10.1148/radiol.2371031757. PMID 16183926. Jump up^ Marks, Allan D. (2009) Basic Medical Biochemistry: A Clinical Approach,3rd ed., Lippincott Williams & Wilkins, p. 757, ISBN 078177022X. Jump up^ Beck, Melinda (January 18, 2011). "Sluggish? Confused? Vitamin B12 May Be Low". The Wall Street Journal. Jump up^ Allen, RH; Seetharam, B; Podell, E; Alpers, DH (1978). "Effect of Proteolytic Enzymes on the Binding of Cobalamin to R Protein and Intrinsic Factor". The Journal of Clinical Investigation. 61 (1): 47–54. doi:10.1172/JCI108924. PMC 372512 . PMID 22556. Jump up^ Abels, J.; Vegter, J. J. M.; Woldring, M. G.; Jans, J. H.; Nieweg, H. O. (2009). "The Physiologic Mechanism of Vitamin B12 Absorption". Acta Medica Scandinavica. 165 (2): 105–113. doi:10.1111/j.0954-6820.1959.tb14477.x. Jump up^ Kuzminski AM, Del Giacco EJ, Allen RH, Stabler SP, Lindenbaum J (August 1998). "Effective treatment of cobalamin deficiency with oral cobalamin". Blood. 92 (4): 1191–1198. PMID 9694707. Jump up^ "If a person stops consuming the vitamin, the body's stores of this vitamin usually take about 3 to 5 years to exhaust". Jump up^ "B12: An essential part of a healthy plant-based diet". International Vegetarian Union. Jump up^ "Mary Shorb Lecture in Nutrition". Retrieved March 3, 2016. ^ Jump up to:a b "Dr. Mary Shaw Shorb – Annual Lecture". Department of Animal & Avian Sciences, University of Maryland. May 10, 2012. Jump up^ Kirkland, Kyle (2010). Biological Sciences: Notable Research and Discoveries. Facts on File, Inc. p. 87. ISBN 0816074399.